Are you having trouble balancing your bills and your savings? Well today’s, financial post reminds us that funding our retirement should not be a balancing act. 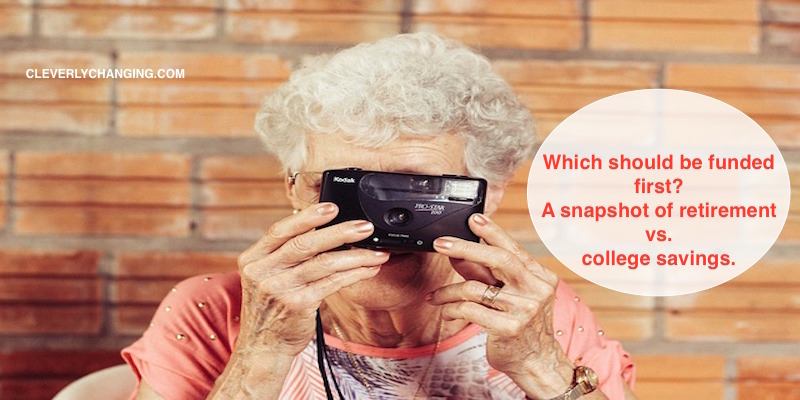 In fact, we will take a snapshot of retirement vs. college savings, and find out which accounts we should start saving for first and most aggressively? Of course our future should matter to us. We often think about the future of our children, our parents, and our jobs, but we should also care just as much about what we will be doing later in life. Especially when we’re older and working may no longer have a pleasant appeal. Funding your retirement is not optional if you want to be financially secure in years to come. Frankly, it’s highly unlikely that you’ll want to depend on your children or another relative to handle your well-being so saving for your retirement is something you must handle while you have many years on your side. As a stay-at-home mom, retirement is often my biggest concern. Us moms often look at our children’s future and are quick to set up a college savings accounts while neglecting our own futures. However, from what I’ve learned over the years, it that it will benefit us more to fund our retirements even more aggressively than save for our children’s college needs. Stay-at-home moms, please don’t wait for your husband savings to equate to you also having a well-funded future. You must take matters into your own hands and begin setting up a piece of the financial pie for yourself. Why is it better to fund our retirements first? I believe, funding our retirement is even more important than saving for our child’s education because your child may have other options to pay for school in the future; for instance jobs, grants, scholarships, loans, etc. Once your child goes to school and does well, he or she will be able to maximize the earning potential he has. On the contrary, if we are older well into our seasoned years, our financial options are much less. Do you think we can just go to the bank and apply for a loan to live from? Not likely. Do you think that our social security from our working years will be able to sustain us? I don’t think so. Sure we can continue working until we die, but we shouldn’t have to; especially if we want to do something else with our time. Remember, we will not have the years on our sides and the cost of living will quadruple by that time we are old, so start taking steps now to secure the life you want to live when you’re older. Frankly, wealth and having money has common denominator that we should remember: compound interest. Dave Ramsey quotes Albert Einstein saying, “Compound interest is the 8th wonder of the world.” If you have time on your side you can become a millionaire. Get started now! Do not wait. Start funding your retirement accounts immediately. I wish my husband and I had delayed the first purchase of our home and maxed out our retirement giving at work before we had children. We gave, but I wish we had given more back then when we were younger. Although, we are still young, time is always ticking and it’s better to get the ball rolling so that the interest can began to double your money while you have compound interest on your side. Get started now and save. Save. Save. Save!